Low compressed air consumption ensures high cost savings. Low vibration levels and a pleasant operating noise protect the user's health. Extremely sturdy design and oil-free motor concept ensure a long service life, minimal servicing requirements and high cost savings. Simplifies permanent dust extraction, guarantees the best working results and protects the user's health when combined with the IAS 3 light hose. Sanding pad brake reduces sanding errors when setting down the machine, thereby avoiding rework and additional costs. High-quality FUSION-TEC sanding pad with MULTI-Jetstream principle ensures efficient dust extraction, minimises rework and saves on costs. Large 5 mm sanding stroke ensures rapid working progress, a high-quality sanding finish and cost savings. 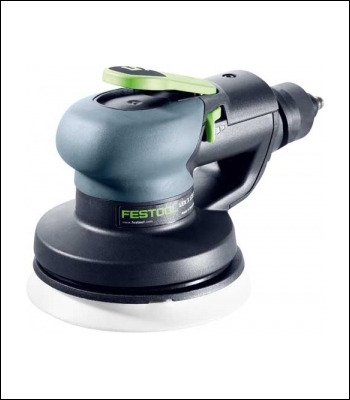 Coarse and intermediate sanding of flat surfaces or curves. Coarse and intermediate sanding of filler, e.g. in 4-step sanding system. Intermediate sanding of wood, paint and clear coats.